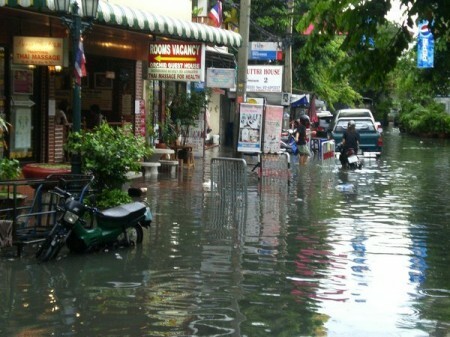 With floods inundating towns and cities, longtime residents of Bangkok and nearby areas of central Thailand, including the ancient capital of Ayutthaya, may wind up having to migrate. Governments around the world are generally ill-prepared and ill-equipped to cope with, much less manage, forced mass migrations on such a scale, but they would have to if global temperatures increase by just a few degrees by 2100, according to the results of a recently concluded study undertaken by an international group of 12 scientists. The research team, which included two researchers from the University of Florida (UF), came together last year at the Rockefeller Foundation’s Bellagio Center on the shores of Lake Como in northern Italy to review 50 years of research to do with population resettlement in the aftermath of natural disasters or as a result of large-scale infrastructure projects such as dams and pipelines, according to a PhysOrg.com report. They concluded that past resettlements “have left communities in ruin, and that policy makers need to use lessons from the past to protect people who are forced to relocate because of climate change,” according to the report. “Sometimes the problem is simply a lack of regard for the people ostensibly in the way of progress, but resettlements frequently fail because the complexity of the task is underestimated,” said Oliver-Smith, a professor emeritus who has spent more than 30 years researching issues associated with forced migration. “Transplanting a population and its culture from one location to another is a complex process — as complicated as brain surgery,” he said. A lot of research is being done on the issue of migration as a result of environmental changes due to climate change. How much action is being taken by governments, as well as businesses and international aid organizations, is open for debate. In it, Brown focuses on examining and analyzing possible future scenarios for forced migration due to climate change and attempts to estimate the developmental impact of forced migration and the resettlement of millions of people displaced by coastal flooding, extreme droughts, other extreme weather events and large-scale disruption to agriculture. Released on Oct. 19, the UK government sponsored “Migration and Global Environmental Change Foresight Report,” warns of the potential for large-scale humanitarian disasters to take place as a result of changing climate, including flooding, drought and rising sea levels. Looking out over a 50-year time horizon, the report is said to be the most detailed study carried out on this increasingly urgent issue, according to a BBC report. The report’s authors conclude that governments and other stakeholders need to act now to prepare for such events, and that the best way of doing so was to assist the world’s poorest to move away from areas likely to be affected.